This Provençal recipe is adapted from a recipe that appeared in the August/September 2005 issue of Saveur magazine. 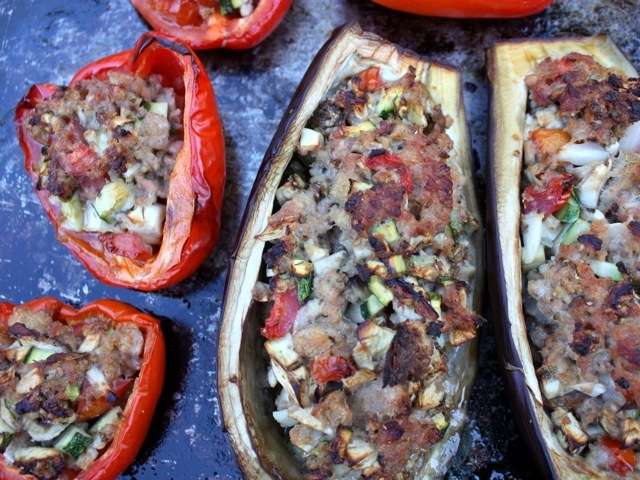 The original recipe called for stuffing the filling inside zucchini, round summer squash, and tomatoes, but the filling works just as well spooned into bell peppers or eggplant halves. Trim the tops off the vegetables. Halve the long vegetables lengthwise and the round vegetables horizontally (for round summer squash, just remove the tops). Discard seeds. Scoop out the remaining flesh (except for bell peppers), leaving shells about ½ to ¾ inches thick. Chop the flesh, put it into a large bowl, and set it aside. Drizzle 1 Tbsp. of the olive oil in a large baking dish and arrange the halves evenly in the dish. Briefly soak the 1 cup breadcrumbs in the milk, then add the crumbs to the bowl of vegetable flesh. Add the crumbled meat, garlic, onion, and salt and pepper to taste; mix everything together evenly with your hands. Add the tomatoes and herbs and mix loosely. Fill the vegetable shells with the stuffing and sprinkle each with the ¼ cup breadcrumbs. Drizzle with the remaining 1 Tbsp. olive oil. Bake for 1 hour, or until the shells have softened (but not crumpled) and the crumbs on top have browned. Serve hot.